Each merchant knows for sure that load times take a toll on customers’ patience. Improve your store performance and let your business shine with our Performance Optimization Service. Magento Performance Optimization Service is suitable for both generations of the Magento platform - Magento 1.x and Magento 2. 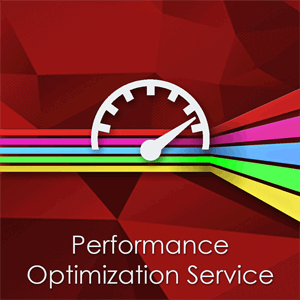 If your store is running slow, this performance optimization service is a solution. This service is the key to have a fast and stable store. As a result, your website will become much faster and stable. 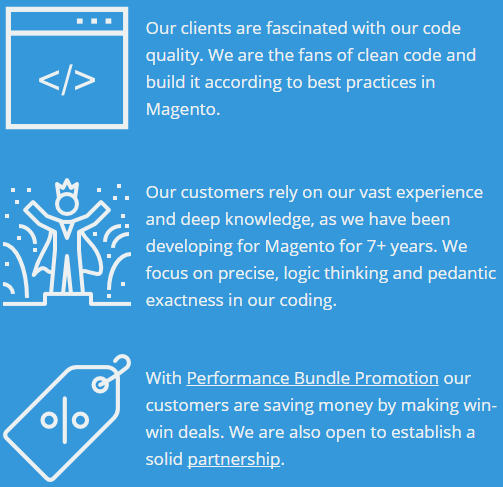 Why you should choose our Magento Performance Optimization Service? Time to first byte (TTFB) is a time period between an initial request to a server and a server response. This is one of the key indicators of web page speed. TTFB should be lower than 1 second. 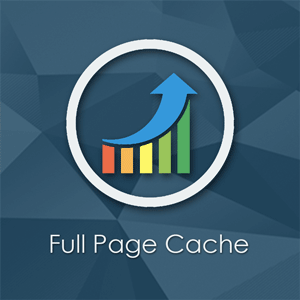 As for Magento 1.x, we use PotatoCommerce Full Page Cache extension extension to decrease TTFB within our service. We have >0.5 sec TTFB in 90% of the cases when we provide Magento optimization service. As for Magento 2, FPC is already built in the platform, and we can check that it’s configured properly. Tip: You can us GTMetrix service (see Timing tab) to check the TTFB of your website. Approximately 60% of a web page size is made up of images. 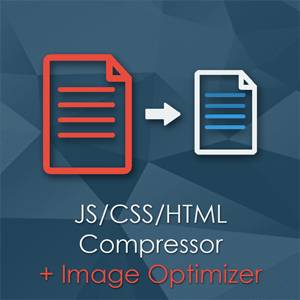 Compression of images (image optimization) will significantly reduce total size of web pages. Our Image Optimizer (it's available for both Magento and Magento 2) is able to optimize files of JPG, PNG and GIF image types. Both lossy and lossless image compression methods are available. Tip: You can use GTMetrix to check whether images are optimized on your Magento store. Merge is combining files of the same type into a single file. For example, a browser will load one merged CSS-file of 1Mb faster, than 5 CSS-files of 200Kb due to fewer requests to a server. Tip: You can us GTMetrix service to check whether JS and CSS files are merged and minified. You can improve overall page speed if HTML content of a page will be minified. Minified HTML code is faster delivered, parsed and rendered by a browser. Image optimization, GZIP compression, merge of JS/CSS files, eliminating excess files and CSS/JS/HTML minify allow significantly decreasing overall page size. Obviously, the lower page size is, the faster it is loaded. Request processing has 4 steps: delivering of a request from a browser to a server, processing the request on the server side, delivering the response to the browser and processing the response on the browser side. Each step takes time. Thus, the more requests a browser makes, the slower a web page loading speed is. In addition, Magento Optimizatoin Service includes encountering and elimination of unnecessary/unused/duplicated scripts, libraries and other resources. 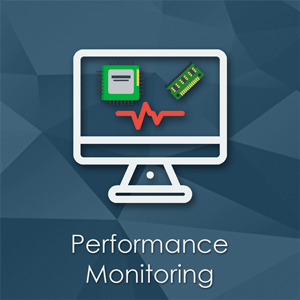 To understand and analyse the performance of your web-server and Magento, it is crucial to have a tool that allows tracking CPU and Memory usage for the last 30 days (or even more). Our Performance Monitoring Magento extension (M1 / M2) is used for that purpose. Its detailed reports have the list of top website and system transactions, which is very helpful in determining bottlenecks. In addition, it allows sending emails to notify a system administrator on high CPU load. This service includes key enhancements of a web-server and PHP configuration. For example, it is important to enable mod_expires, mod_gzip (used to accelerate processing of client requests). We can also modify some PHP parameters (memory_limit, max_execution_time, etc.) if necessary. We fix possible compatibility issues with your web-theme and third-party modules that influence overall performance. Please keep in mind that this service does not include fixing bugs of third-party products, as well as theme optimization, making image sprites, images rescaling. It takes much time and requires a qualified technical specialist to configure a server and all installed modules properly. These tasks are not trivial as it may seem at first sight. Each store is unique and has a great variety of 3rd-party modules and themes. Sometimes, configuration of our extensions and server may take up to 8 hours. Varnish is a caching reverse proxy-server and HTTP accelerator. Varnish effectively uses the capabilities of modern multiprocessor systems. The cache can store any information; as a result, Varnish is great to cache dynamic content. This allows Varnish to reduce response time and CPU load for future equivalent requests. So, if you want to speed up Magento 2, Varnish is a must. We offer Varnish configuration for Magento 2 stores within the service. A list of our recommendations for further performance improvement. How fast my website will become after Magento Performance Improvement Service is provided? Our customers are satisfied with the significant changes on their websites which have been achieved with the help of our performance service. Our qualification and experience in developing Magento products for 6+ years allowed us to release the best optimization extensions on the market. Please have a look at all our reviews at Magento Connect. Are there any specific requirements to a server? The service includes installation of extensions, additional server applications, modification of file permissions and server configuration parameters (editing .htaccess, php.ini, enable 'exec' function, change 'max_execution_time' etc.). That is why, it is necessary for us to have such access. 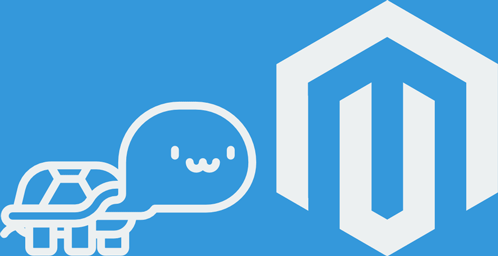 How quickly can PotatoCommerce provide Magento Performance Improvement Service? Usually it takes 1-3 days to start working on the service and 1-3 days to finish. The exact time depends on our technical team current workload. But you can be sure, we will do our best to provide the service as soon as possible without delays and our support team will keep you informed regarding the whole process. Do you provide discounts for development agencies? We provide 25% lifetime discount for development agencies. Learn more. What is the refund policy for this service? 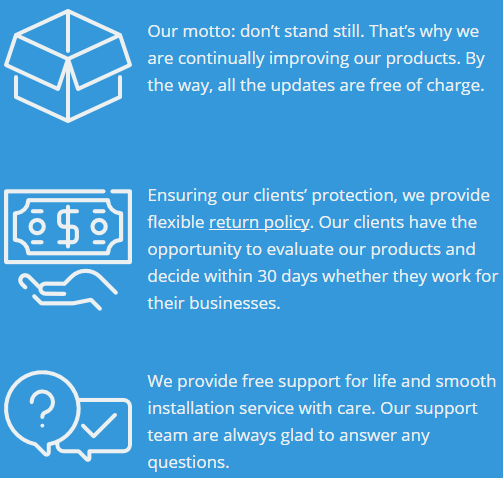 Basically, we provide 30 day money back guarantee if our extensions do not meet your needs. 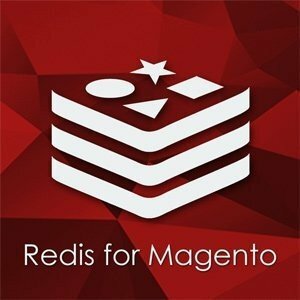 As for the Magento Performance Optimization Service, the service price consists not only of the extension licenses price, but also of the price of additional work of our technical specialists who install and configure the extensions, fix compatibility issues and check that extensions are working properly on the ground. According to our Customer Service Policy, we don't refund installation, configuration or any custom/extra work. Therefore, if the service does not meet your needs, only partial refund can be issued. • If you purchased the service for Magento 1 СE ($299), then you will recieve $199 back ($299-$100=$199). • If you purchased the service for Magento 1 or Magento 2 Enterprise Edition ($599), then you will recieve $399 back ($599-$200=$399). • If you purchased the service for Magento 1 CE with 15% discount for Partners ($254.15), then you will recieve $154.15 back ($254.15-$100=$154.15). • If you purchased the service for Magento 2 СE ($399), then you will recieve $299 back ($399-$100=$299). Please keep in mind, that you can get the money back only after we uninstall all the extensions from your store and rollback all the changes provided within the service. Do you provide support after the optimization? Yes, we provide free and lifetime support of our paid extensions, besides, you can get the latest versions of Compressor and Full Page Cache extensions if any is released. For more details please go to Customer Service page. By purchasing this service you thereby accept all our regulations, the License Agreement and our Sales and Refund Policy. I use the best theme and the best optimization that I found. My Google page speed result for Mobile: 99 and for desktop: 81. They provide a very detailed service. And focuses on the problem until it is solved. My Google speedscore was 46 before the optimisation work. Bad for conversion and for seo. Now it is 86 and it makes a world of a difference. Thank you for the amazing work and all the extras you've done for me. We had really slow Magento 2 store, page loading time was >10s. Now it works must faster. They provided this service 2 monts ago, there was 2 issues with 3rd extensions, but support was fast and effective. By the way, we've recently noticed an improvement in our SERP positions and traffic. Thank you Potato team! My CE store achieved amazing GTMetrix results from this service. We have around 10,000 products in a couple hundred category and our store absolutely hums. The support is among the best I've experienced in my 20+ years in ecommerce. They really seemed dedicated to making sure everything is working perfectly. We were in a time crunch with our latest launch, and the PotatoCommerce developers were extremely responsive with every issue that I came across. More than once they worked late into the night helping me get my Magento store working like a well-oiled machine. These guys are truly experts in Magento site optimization and I highly recommend their performance optimization service.